Wisconsin will take on Minnesota for the national championship game this afternoon, and these teams aren’t strangers to playing each other. This will be their sixth meeting of the 2018-19 season; Wisconsin took the last one, a 3-1 win in the WCHA championship game. This is the first Border Battle for the national championship game since 2012, when Minnesota took home the title. The Badgers defeated Clarkson in a 5-0 win on Friday, though it was a 1-0 game until about the halfway point of the third period. Wisconsin’s penalty kill also came up pretty big in this game. Clarkson had a couple of opportunities to swing momentum in the second and third periods and grab a potentially game-tying goal, but their penalty kill unit stepped up. For the game, the Badgers killed off four Clarkson power plays and only yielded three shots on goal while down a player. I thought Wisconsin showed a ton of poise to take complete control of the game in the third period. The Badgers at times have let teams hang around too far into the game this season (two overtime wins against Harvard earlier in the year stand out in that regard). But they didn’t let Clarkson back into this one at all in the third, instead erupting for four goals of their own. 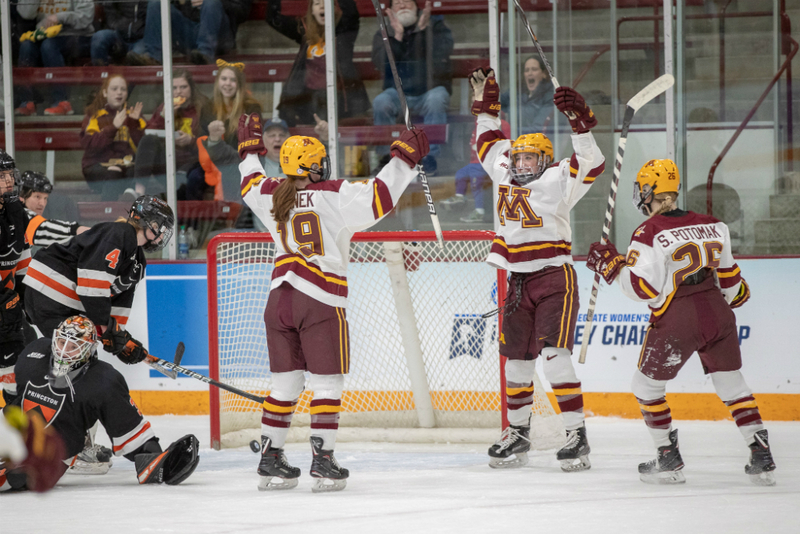 Minnesota advanced after a 2-0 shutout win over Cornell on Friday evening. The Gophers turned in a really solid defensive effort on Friday, blocking 30 shots to help out goaltender Alex Gulstene, which was nearly half of the Big Red’s 64 shots attempted. For comparison, Cornell blocked 12 shots, and Minnesota attempted 52 in the game. It was a little bit of a shift in style for the Gophers. Both teams received good performances from their penalty kill units on Friday; both teams kept shots-against totals low and earned shutouts in the semifinals. Wisconsin did that by driving possession; Minnesota did it by committing to the defensive side of things and capitalizing when they had a player advantage. I think Wisconsin probably turned in a more convincing effort against Clarkson, not only because of the goals they scored in the third period, but because of their total possession. It took almost 50 minutes for their efforts to really pay off, but the Badgers controlled the pace of play almost the whole way through. As Mark Johnson mentioned after the game, they were really strong at five-on-five, and they need to turn in the same effort against the Gophers. For Minnesota, I think it’s definitely a positive that they were able to come out on top of a defensive battle, but I also think Wisconsin has more weapons than Cornell. 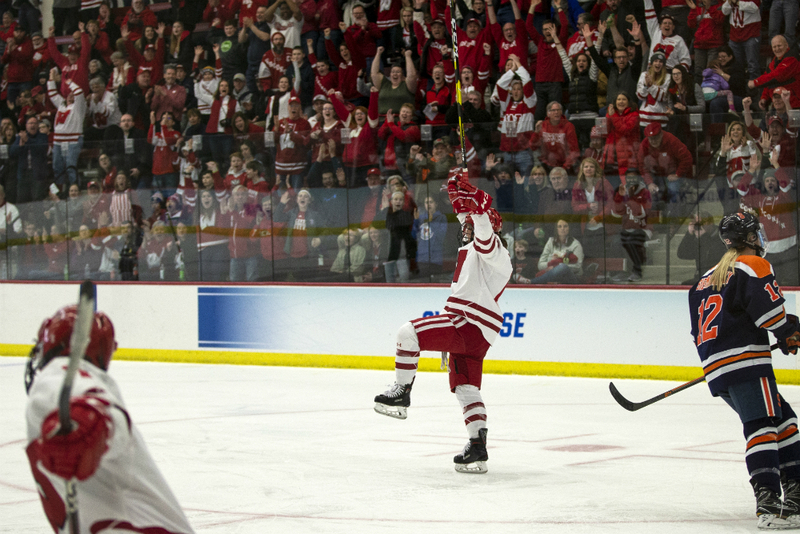 The Badgers have shown a good ability this postseason to create quality chances, not just lower-grade shots. Wisconsin will want to keep that up and work to dish the puck through openings to get the best of Minnesota’s defense. The Gophers played well in front of Gulstene on Friday and could frustrate Wisconsin if they do so again. But I have to think they want the puck more against a Badgers squad that’s shown some real poise and scoring prowess in their last few games. Annie Pankowksi is leading the charge up front for Wisconsin and scored a back-breaking goal against Clarkson off of sheer willpower (and a deft scoring touch, of course). If she continues that type of play, she’ll be an important player in the title game. It was also good for the Badgers to see the line of Abby Roque, Britta Curl, and Sophie Shirley get on the board. Curl made a great feed to Roque for the game-opening goal, and Shirley did a good job of driving to the net and bringing a defender with her to open up space for Roque to shoot. That line as a whole possesses really strong offensive instincts, and consistently get good looks for the Badgers. I think Sarah Potomak has shown a lot of potential to step up and be a game-changing player for the Gophers in the national championship. She obviously had a great game against Princeton in the quarterfinals, tallying four points. She also nearly put the Gophers ahead early on against Cornell, just nicking the post on a breakaway try that beat the goaltender. Potomak then scored the empty-netter to seal it, digging a puck out of her own end and hurling it all the way down. I also think the Gophers would gain a lot by getting the Taylor Williamson, Taylor Heise, and Alex Woken line going against the Badgers. That line created some good pressure for the team against Cornell but hasn’t generated a ton of production in the postseason so far.